Symbicort is a bronchodilator to treat asthma and chronic obstructive pulmonary disease (COPD). The medicine contains the substances budesonide and formoterol fumarate dihydrate. 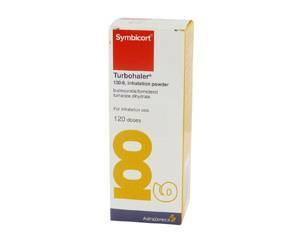 Symbicort Turbohaler prevents attacks of breathlessness, inhibits inflammation and protects against respiratory stimuli. It works as a bronchodilator, so the sinking feeling decreases and you can breathe easier. Breathe properly first before you inhale the Symbiocort medication. Then deeply and powerfully breathe through the mouthpiece of the inhaler. The medicine comes directly into the lungs where it operates optimally. Do not breathe out through the mouthpiece. Finally, rinse your mouth with water to prevent the risk of fungal infection. It may be 1-2 weeks before you notice the desired effect. So do not rush if you are in doubt about the operation. Do you want to stop with the Symbicort Turbohaler, reduce the use slowly. Discuss this with your doctor. Use the dose prescribed by your doctor. It depends on the severity of the complaints to what extent you should use Symbicort. The usual adult dose is 1 inhalation twice daily. For children from 6 to 11 years there exists a special variant. For the desired results it is important that you use Symbicort every day. Make sure you have a regularly check by your doctor, so you always use the right dose. Symbicort gives possibly side effects. Common side effects include headache, sore throat, hoarseness and dry mouth. It is important that you rinse your mouth after using Symbicort, to wash away the residual substances of the medicine. This reduces the risk of fungal infection. You will find the complete list of side effects in the Symbicort leaflet. Using Symbicort is not recommended during pregnancy and lactation. Symbicort is not suitable for children younger than 6 years.